Today we’ll be speaking with Julia Korsunsky, whose story we first heard on Nash Holos last year. 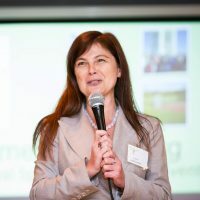 Julia is the Executive Director of RememberUs.org, a non-profit organization based in Massachusetts. Her organization is involved in commemorating mass grave sites of Holocaust victims, which include her great grandparents and many other relatives. Last year we learned about a project her organization is involved in, which is planting trees at killing sites in order to commemorate victims of genocide. These trees by their nature are appropriately symbolic for this purpose. The trees have been planted at several sites now and the project continues. However it is just part of a larger endeavor, and Julia Korsunsky, Executive Director of RememberUs. Org has kindly agreed to tell us more about it. Pawlina: Welcome, Julia, to Nash Holos! Julia: Hello, glad to be here. Pawlina: It’s great to connect, and it was wonderful to hear you story. We heard your voice a bit; Peter shared some of his recordings of your conversation but it’s nice to see your face—well I can see your face, our listeners can’t, but it’s wonderful to connect with you on Skype and thank you again for joining us. We talked about the metasequoia project so give us a bit of a recap about how it all started. Julia: Well it’s a very long story how it all started. We can go as deep as to my childhood. But basically it all started with a memorial that is held on a place of atrocity in Kharkiv, which is a place called Drobytsky Yar. It all started as a family project. We just wanted to commemorate my family and plant some trees there. And then we were picking out trees. And as you just mentioned, the metasequoia was the most appropriate kind of tree because of its history and that it lives for a very long time. So we can create an ever-living memorial at that place. When we started doing it, we realized that it would be a very good and nice gesture, but no more than that. And this memorial in particular needed much more help than we could as a family provide. And that was the beginning of our organization. 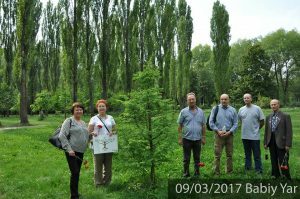 So as soon as we planted the trees there we were asked to plant trees in other places, and that started the whole program and framework. Pawlina: Now, яр (yar) is the Ukrainian word for ravine. 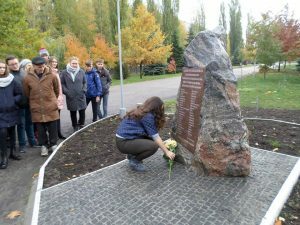 And Babyn Yar is quite familiar to anybody who has studied the Holocaust or is aware of the Holocaust in Ukraine, because it’s located in Kyiv and they recently commemorated their 75th anniversary of that atrocity. But this happened in many other places in what is now Ukraine and Poland, and other parts of eastern Europe where a lot of the Holocaust was by bullets, essentially. You found your family in Drobytsky Yar, and that is near in Kharkiv, in eastern Ukraine. How did your family discover your roots going back there? You said it was your great-grandparents that perished there? Julia: Right. The story started in my childhood. When I was a child and learned in school about Babiy Yar, and I came home and I was amazed that something like that could happen in my country. I had heard about the Holocaust but I thought Holocaust was somewhere in a faraway land. I didn’t realize that it took place in Ukraine, too, or the Soviet Union. And that was, probably, a 30-second conversation, that I remembered as a child. But only as an adult, I came back to that memory. The first time I went to Drobytsky Yar already as a visitor to Ukraine from the United States, which was very recently. Standing there, on that soil, was when the understanding of what happened really was a big revelation to me. It’s a very strange, and very scary (to tell you the truth) experience. Pawlina: I would think it would be. Now you grew up in Ukraine. How long have you been in the States? Pawlina: But you were a child … and now you have a daughter? Julia: I wasn’t a child. But yes I have a daughter and I have a son as well. Our son is not part of the organization, but our daughter is. We started the organization, the three of us, my husband, myself and my daughter. Pawlina: So let’s talk about the organization, RememberUs.org. Julia: Well we saw that we can really help only by creating a formal structure, my husband and I started doing it. Our daughter was very supportive and she also became part of this process. It took a few months for us to do all the paperwork, and within three months we went from a three-volunteer organization—a family kind of organization—to four people, six people, seven people and now we are over 30 volunteers, four and a half years later. We are an all-volunteer organization, there is no paid staff. Of course we do pay money for work, as expected. But ongoing projects are led by volunteers, the volunteers come up with the ideas, and that’s what we do. Pawlina: The trees, you said, that was your family idea to commemorate your own family’s site. So who was it that asked you next to plant them elsewhere? Julia: I think the next one was Kremenchuk. We now have a long list of communities that we’re working with. And Yar, yes, that’s the Ukrainian word for ravine, and Babi Yar is the only one that is known. But there are over 1000 yars in places like that. In some of them, thousands of people were murdered. In some of them hundreds, or just a few people. 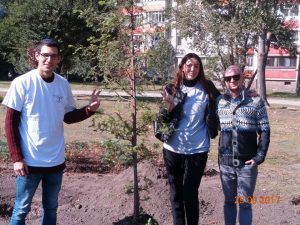 We worked with Lybny, Zasul`ye community, with Kremenchuk, Bila Tserkva, Myrhorod. We also worked with Babyn Yar, of course. We also planted metasequoia trees there, as well. Pawlina: So this project has grown, and it’s continuing to grow? Julia: Yes, this particular project is part of a bigger framework that we call the Last Mile. So the Last Mile framework has multiple milestones. One of them is planting trees and raising local awareness that things happened right here, right in your back yard. The next milestone to this Last Mile framework, we create a Holocaust memorial and museum exhibition in the local schools. And examples of such exhibitions are in Lubny, Zasul`ye and Kremenchuk. We also, as the next step, we not only create those artifacts, but we also create a means to learn from those places. So we organize and sponsor school and college tours to places of atrocities and to the museums, so kids can be educated at that place. Because it’s completely different when your teacher is standing in front of you and trying to tell you stories and numbers, versus when you are standing there on the soil, it’s a completely different scene. So that’s the complete framework. Julia: Yes! That’s exactly why. Lots of us are in IT industry, and the last mile is a pretty common term in the IT industry and communications. Pawlina: Oh, I didn’t realize that. So you’re in the IT business then? Julia: Yes. I’m in IT, my husband in is IT. As I said we are all volunteers, so we have people from many different industries. We have lots of students; that’s our biggest group of volunteers—high school and college students. Pawlina: So these volunteers—you said you’ve got over 30 now—where are they located? Julia: All over the U.S. and all over Ukraine. We have people in Boston, Washington DC, New York, and we have people in Kharkiv, Myrhorod, Lybny, Zasul`ye, Kremenchuk, Kyiv, Bila Tserkva, and I am probably missing something. Pawlina: So what are some of the tasks that these volunteers are involved in? Julia: A lot, actually. They do a lot and they do an absolutely wonderful job. What’s important to me is that those volunteers have completely diverse backgrounds. Some of them are Jews and many of them are not. And that is very important to me because we work together. It doesn’t really matter what your background is, as long as you understand that it was a tragedy that needs to be remembered, that needs to be remembered not only for the past but also for the future. The next generation needs to learn about it. Only then can we achieve some results. So, back to your question. They help us to organize different commemoration and education events. For example, if you go to our Facebook page, you will see pictures of that. We have in Zasul`ye we have a school museum there, and there are high school kids who are tour guides in that museum. Which is fantastic, because they speak the language of their peers, they can react to their friends much better than if that was done by adults. Of course they work with directors of the schools who guide them. But we are the ones who are actually doing the work. Similar things are done in Kharkiv where we didn’t build any museum, but we do have ongoing tours, and volunteer tour guides there. Pawlina: In North America, what would a volunteer be doing here? Julia: Here what we do…also lots of different things. Another example, we have face to face presentations. Someone called me two years ago, and the lady said,” You usually do presentations in front of kids or grownups of younger generations. Have you thought of doing it in front of older people?” I was at first taken aback because I didn’t realize what the goal. And she said “Well if you talk to seniors, if you talk to veterans, then you see that there is someone who is picking up the baton of that knowledge, that there is continuity of that knowledge. And I thought, wow, that sounds like a good idea. So this lady worked with someone on our team and organized the first presentation. That first presentation was done by our local high school students, and it was one of the most emotional presentation, because they were talking to seniors, to people who actually lived through those events. That became our ongoing program, and that program is very beneficial for both sides. In fact, in the program we uncovered that one of the Righteous Among the Nations lives right here. So our students were able to connect to him, to get his story, to record that story, which was also very valuable. Pawlina: Wonderful work you are doing. The Last Mile project is only one of many. You’ve got shtetl tours…just give us a little bit of an idea of what that’s about, and some of the other projects you’re involved in. Julia: Forgotten Shtetl trips is also a very interesting and popular project. 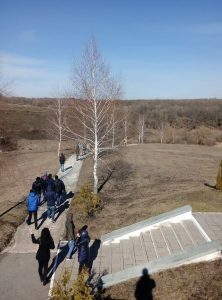 What we do is we take our volunteers from Ukraine and from the US and we take them into those places where atrocities were [committed], where Jewish communities used to live, and we show them how the Jewish community used to live together with the Ukrainian community; how it used to look. 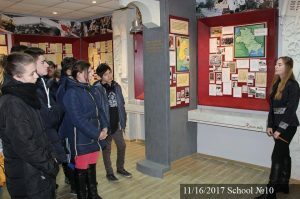 And there are a lot of historical artifacts there, and there are enough older people who know and can tell different stories…stories of the Holocaust, and stories that they’ve heard even before the Holocaust; family stories. So it’s a very popular program. Pawlina: Is this just for volunteers or is it open to the public? Julia: For now it just is for volunteers and teachers. I’m thinking of extending it next year, to open it to the public. But for now, it’s on a smaller scale. We’re about to go on our third trip this summer. Pawlina: Oh, so this summer will be your third. I see. So if somebody wanted to get involved in your organization, support your organization, what are your needs? Julia: Immediate needs… I’m going to be frank about it… are funds. That’s the hardest. It just happened that none of us is a professional fundraiser so that’s our biggest challenge. So if people want to get involved, or have an idea of projects to implement, I am happy to talk about it. They can get in touch with me either by email or Facebook. Or if someone wants to donate we would be glad. Pawlina: So, donations or volunteer help for fundraising. And you were saying everybody is a volunteer, so this is all done from the heart and there’s a personal reason to get involved. I guess personal satisfaction as well, through the work. Julia: Exactly. We are volunteers. We are doing it not for financial gain, or a project that we do for a living, so motivation should be your personal passion. Pawlina: So tell us again Julia how to reach you. Pawlina: OK, well that’s easy to remember. A great name and also a fantastic project. Thank you so much for sharing your story, and for the work that you do; for your passion to let people know that yes, there was tragedy in the past but we can learn from it. I think it’s a special person that can share their personal tragedy and try to help others learn from it as well. So thank you so much for doing that, Julia.